Organic research is one of the key components to measure your SEO efforts as well as see what others are doing to outrank you in the SERPs. Today we’ll discuss about how to use SEMrush’s organic research tool to see what pages of your website are ranking and Google and how has the performance been (loss or rise in rankings with time) and similarly find the top pages and the top organic keywords bringing the most traffic to your competitors’ websites. This data is very important and can help you optimize your pages and steal your competitors’ keywords to outrank them. What is SEMrush Organic Research tool? SEMrush Organic Research Tool is that magic wand that not only shows you how you perform in Google search results (along with the performance trend), find competitors websites, check how they’re performing and what keywords your competitors are ranking for. There’s a lot more to discover and learn. Let’s look into it in details. You’ll need an active SEMrush subscription to use this service. But for the sake of this tutorial, you can grab a 14 days free trial of SEMrush so that you can do all of this without having to invest a dime and if you find it useful you can continue using their paid subscription. 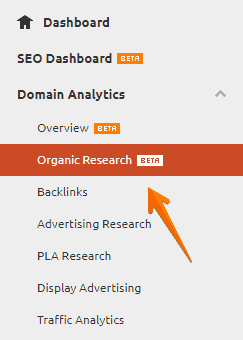 Okay before I go into the details, let me tell you how to locate this new organic research tool inside SEMrush. From SEMrush dashboard, find the menu options on the left. Find the option: Organic Search, and you can see the Organic Research option under that. As of now, this is in beta stage, so you should see a beta tag against it. Else you can locate it under Domain Analytics > Organic Research. The central area is pretty simple. It allows you to put any website URL over there and it will load the detailed analytics of that website. Enter any domain or subdomain over the specified field and choose your country of the database. For the sake of this tutorial, we’ll take the example of one of my favorite blogs, ShoutMeLoud.com . Let’s find out the analytics for that blog. Please Note: We’re taking a competitor analysis approach for this tutorial but you can use this exact steps for organic research of your own website to see how you’re performing and where you need to improve. The new SEMrush Organic Research Reporting adds everything under one section to you can slide to select different options to analyze your website or that of your competitors. …estimated traffic it gets, keyword trends (number of keywords that rank in position 1-3, 4-10 etc), top organic keywords that bring it the most traffic, changes in keyword positions, SERP features (like site’s appearance in featured snippets, carousels, videos etc in the SERPs). The overview section also gives you a brief of the site’s top pages (based on organic traffic) and top competitor sites. The first thing you will notice is the Estimated Traffic graph. As of now, shows the past 10-month traffic for the website. Maybe after the beta period, it will show data for a broader range of time. Hover your mouse over the dots on the graphs to find the month to month traffic changes. Analyzing the graph you can see that the overall traffic of the website has decreased by almost 50% in the past ten months. In August 2017, they received around 169k traffic, and after a few ups and downs, they are now with about 79k traffic as of May 2018. Pro Tip: All these are displayed data for the United States, if you want you can change the database country from the top. Keywords: Shows the total number of keywords that are ranking for that domain in the top 100 positions of Google’s SERP. Traffic: The current monthly traffic for the website. Traffic Cost: The estimated amount you need to spend on Google Adwords to rank for the organic keywords. Non-Branded Traffic: Traffic from non-brand name keywords. In short, this is the total traffic minus the branded traffic. The total number of keywords that have ranked in the top 100 in Google SERP. The number of keywords that have ranked in each position slab. There are five position slabs: Top 3, 4-10, 11-20, 21-50 and 51 to 100. A specific color coding designates each position slab. The change in these statistics each month for the past ten months. This will help you analyze the type of keywords the website is ranking for. This section gives you a brief of how a site is performing as far as SERP features are concerned. These are again broadly classified into two types: The results linking to the domain, and the ones that aren’t related. Linking to Domain: These contain the keywords that relate directly to the website. Review: The keywords have star ratings in Google SERP that leads to review articles. Featured Snippet: The keywords that are appearing as featured snippet to the website. Featured snippets are small portions of a site fetched by Google, containing the answer to the query being searched. Video: The keywords that are appearing as videos in the Google SERP. Site Links: The keywords that link to the website as a brand name. Tweet: The keywords that show twitter-style cards in the Google SERP. Not always linking to the Domain: These contain the keywords that pull up additional characteristics in the Google SERP. Images: The keywords that pull up some pictures in between other results in the Google SERP. Note that all pics may not necessarily redirect to the website. Knowledge Graph: The keywords that pull up the knowledge graph to the right of the Google SERP. A knowledge graph contains necessary information about the search query. You can find a knowledge graph when you search for a movie name or a disease name. Local Pack: The keywords that pull up Google Maps in the Google SERP. Instant Answer: The keywords that provide a direct answer to the search query. For example, if you search the meaning of any word, or any small calculation you will get a direct answer. News: The keywords that pull up the news card in the search results. If you always wanted to know the list of keywords that are ranking for your competitor, then this is where you will find it. This is immensely helpful in analyzing your competition. You can locate it in the Positions tab on the top. Position: It provides the change of position data for that keyword over time. Locate the keyword: “how to hide friends on Facebook” and see its position. It has come down from 7th position to 9th position. That means the keyword has lost its previous ranking. 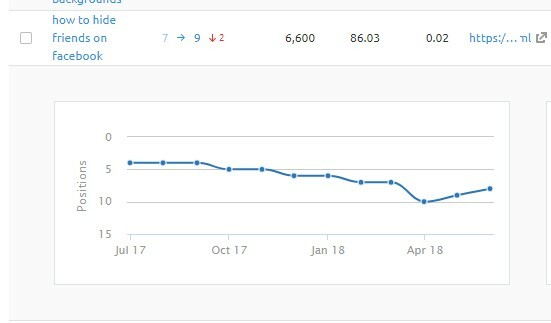 If you click on that ranking, a graph will load where you can see the ranking position for that specific keywords over the past few months. This data can be useful for you to optimize your posts (or create new ones) to outrank them. Volume: This is merely the average search volume for that keyword per month for the last 12 months. Keyword Difficulty (KD): It is a measure of how difficult it will be to rank the keyword in the current scenario, on a scale from 1 to 100, where the higher the number is, the more difficult it will be to rank. CPC: CPC or Advertiser Cost Per Click is the average price advertisers are paying per click from an ad triggered by that specific keyword. URL: This is the url of the website page which is ranking for that specific keyword. Traffic: This is an estimated average organic traffic the website is receiving for that keyword from the url that is ranking in Google SERP. Note: Don’t confuse traffic with search volume. Search Volume refers to the total number of searches that keyword gets in a month. Traffic is only the number of visitors who visit that particular website. Traffic Cost: The total cost of the traffic that the website receives from the concerned keyword. Use this as a measurement of how valuable is the traffic. Competition: This is a measurement of how competitive is it for the advertisers to run an ad for that keyword. It has a range from 0 to 1, where 1 specifies the most competitive density. No of Results: This is the number of search results displayed for the given keyword. Keyword Trend: This gives a graphical representation of the keyword trend for the past 12 months. This helps you to know whether the concerned keyword is trending for just a specific period of a year or throughout the year. SERP Snapshot: This shows a snapshot of the SERP. 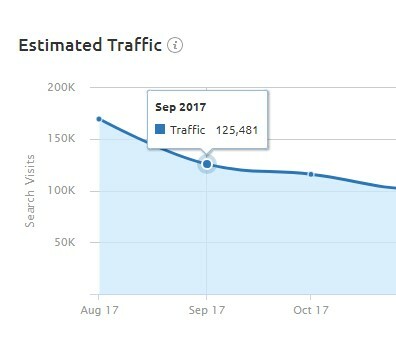 Last Update: The date when this SEMRush data was last updated. …that’s why it is essential to know about the changes in keyword positions in the SERP. That’s where this position tab becomes useful. You can find a ‘New and Lost Keywords’ Graph at the top. To get the list of these keywords, scroll below. You will find a table similar to that of the ‘Positions’ page. New Keywords: These are the list of keywords ranking for the website that recently got added in the SERP. Lost Keywords: These are the list of keywords ranking for the website that recently dropped their positions from the SERP. Improved Keywords: These are the list of keywords ranking for the website that are gradually improving their rank in the SERP. Declined Keywords: These are the list of keywords ranking for the website that are gradually losing their rank in the SERP. You can also filter by keyword or use advanced filter options to sort further. Those options are available right below the tabs on the top. Competitive Positioning Map: This is a graphical representation of the top competitor websites in a Keywords vs. Traffic plot. The x-axis shows the number of keywords and the y-axis shows the traffic measure. Also, the size of the circles determines the visibility of the website on the SERPs. Competition Level: This is a measure in the percentage that determines how competitive is the domain concerning your site. The higher the rate, the more the competition. Common Keywords: It gives a count of the keywords that are common between the competitor domain and your website. Search Engine Keywords: This is the total number of keywords that are ranking for the competitor domain. Traffic: This is an estimated total monthly organic traffic that the competitor domain receives. Costs: This gives an estimated total value of all traffic that is received by the domain. Paid Keywords: This is the number of keywords the competitor has paid for, using Google Adwords, to rank on SERP. I have sorted them based on the competition level. So, the top most competitor of ShoutMeLoud is WPBeginner with 4.7k common keywords. It’s obvious, since both the blogs deal with SEO and Blogging. If you click on the common keywords count, you will be redirected to the Keyword Gap tool of SEMRush where the common keywords for each domain are compared. It shows important stats such as the ranking position for each domain against that particular keyword, the keyword search volume, keyword difficulty, CPC, trend, etc. It is an entirely different tool, and we are not discussing details about it here. But, while you’re there feel free to click and explore to find new content ideas and profitable keywords you’re missing out on. The pages tab lists out the pages that are indexed in the Google SERP. This list will help you know the top pages that receive the most traffic. Traffic: The estimated organic traffic that the page receives. Traffic Percent: The percentage of organic traffic that the page receives, compared to the total traffic of the website. Keywords: The total no of keywords the page is ranking for in Google SERP. Ever wondered how to find the sub-domains of a website? Sub-domains can often be ignored but are significant to find out hidden content,lead generation funnels and monetization strategies of a domain. Click on the “subdomain” tab of the resultant screen on SEMrush. The sub domain tab will give you an overview of the active sub-domains of the website, the traffic they receive and the number of keywords that are ranking for each of them. 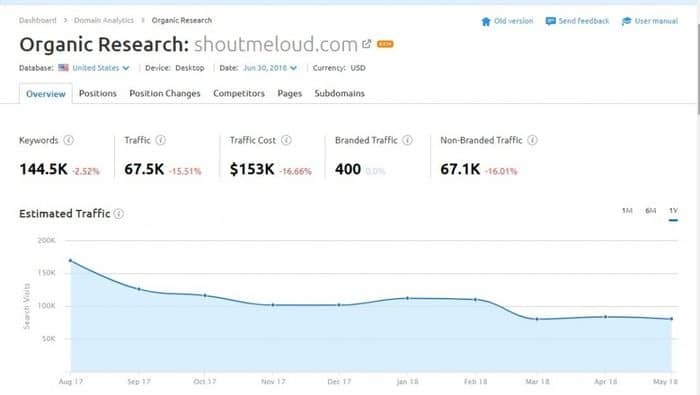 It clearly shows ShoutMeLoud uses sub-domains to declutter their main site and to boost engagement as well as monetize the traffic with a premium subscription. You can now view the traffic stats, ranking keywords and everything else for these sub-domains individually. So, these are all the data you can obtain from the SEMrush Organic Research tool. 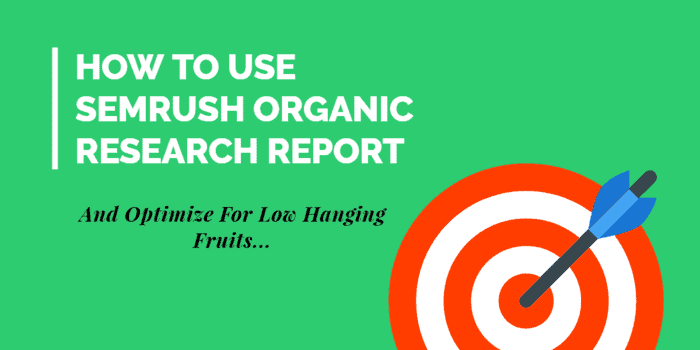 Over to You: How Do You Use SEMrush Organic Research Report? Well, if you already have a SEMRush account, why keep yourself limited to the organic research only? Click here to explore an entire tutorial on how to use SEMrush (inclusive of backlinks and keyword research tips). You will know the full potential of SEMrush when you go through that articles. It’s fun! Top ranking keywords for any website, their positions, traffic and trends. I hope you liked this tutorial on how to do organic research using SEMrush. Have a trick or SEMrush strategy I didn’t mention? Feel free to comment below and let’s discuss! Hi Swadhin, I did use it in my free trial for that short time, I love their tool – even the free version. I wish they had one less than $99/mo as well. I’ve learned a lot from their weekly emails about suggestions for my site and a few fixes too. Awesome! The $99 version is on my bucket list for my business tools. I’ve bookmarked this tutorial as well as it will come in handy! Keywords really can make a difference in traffic and sales. Thanks for the info Swadhin and have a great day!